Everything about college is expensive. In the end, the sacrifices will be worth it, but that’s no comfort to a poor college student staring at a few hundred dollars worth of textbooks every semester. 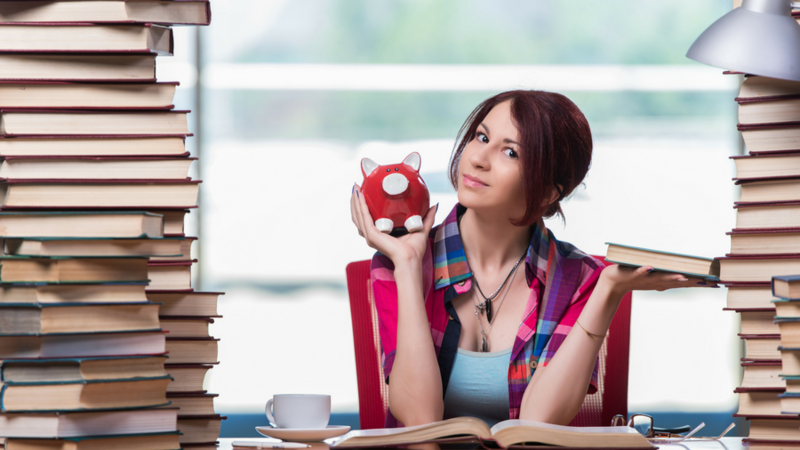 On average, college students spend $1,200 a year on textbooks alone! Luckily, there are a few places you can go to save a few dollars. Many classes are taught from a single syllabus that governs multiple sections with many different professors. That means the book list may not be 100% accurate for the course you’re in. Hold off on buying books until the first day of class and ask your professor candidly how much the text is necessary for the course. Most classes are taught by adjuncts and graduate students who share the pain of expensive, never-used textbooks. You’d be surprised how many of them are willing to provide tips on the relevance of older editions or suggestions for sharing textbooks. The first day of class can be helpful for another reason – you might find a friend who’s willing to share the textbook with you. This may not be an ideal solution, but splitting the cost of a new book in half can be tough to beat, even with rentals and online shopping. Most libraries work on donations. In college towns, people move in and out frequently and want to leave textbooks behind. These two factors mean that a lot of libraries are going to get textbooks. Checking one out for the whole semester may not be feasible, but it might help to grab it for a few weeks to study, or to help make sharing with a friend a little easier. Search engines have made it easier than ever to find the lowest price on everything, and textbooks are no exception. They do have one qualification, though: changing editions. Particularly for math and science courses, problem numbers and answers are frequently among the only changes made from year to year. The best way to counteract this is to shop by ISBN. You can find this number on the book above the bar code. This number is tied to the specific edition and title, so there’s no chance of getting the wrong book by accident. A variety of online stores will offer rental textbooks. These work just like the textbooks in high school did. You pay a fee at the start of the semester, and the company ships you the book. You ship it back at the end of the semester. Some sites will rent for around 60% of the price of a new book. In recent years, publishers have been increasingly moving toward e-book publication as a way to get their textbooks out. Printing and distribution costs are much lower, so the prices for the books themselves tend to be lower as well. As an added bonus, no one’s thrown their back out from carrying an e-reader all over campus!